Just 23 years old, Sords is already a veteran on the stage. He won the 2005 National Shirley Valentin Violin Award; the 2004 and 2005 National Federation of Music Clubs Competition; the Fortnightly Music Club of Cleveland Competition; and the Festival de la Orquesta Sinfonica de las Americas Competition of the Casals Festival. 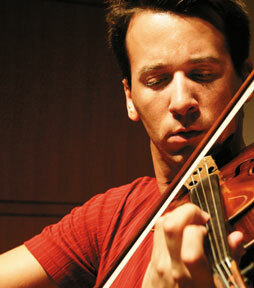 Sords graduated from the Cleveland Institute of Music, together with violin prodigies Linda Cerone and David Russell. His soloist career has taken him from concert halls across North America to settings in Europe, Latin America, the Caribbean, and Asia. In the recent past, he studied under widely known violinist Chee-Yun at Southern Methodist University in Dallas, Texas. According to MPO Director Joe Schlefke, Sords approached MPO to be part of the concert, and is thrilled with the great collaboration of romantic, heroic, and introspective moments. Lavender spoke briefly with Sords, who said he is very excited to visit this state for the first time, and to work with MPO and Schlefke, whom he described as warm and friendly. Sords explained that with everything going on in today’s world—politics, swine flu, the economy—now is the perfect time to come to the concert for an escape. “If you are transported for even a second, then we did our job!” Sords enthused. Sords is excited to be able to play for elementary students, as he has done in the past in other cities. He wants playing the violin to appear fun to them, and to inspire some young people to play. He remarked that children ask the best questions, even better than adults. Sords also confided that he hopes to visit the Mall of America while he is in town. MPO, founded in 1993 by Kevin Ford, includes players from vastly different backgrounds and orientations who share a goal of inclusiveness and nondiscrimination. For more information on MPO or guest performer Sords, visit www.mnphil.org.